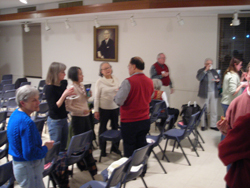 Today, 23Feb10, I attended the first general meeting of the year for the Heart of America Japan-America Society in Kansas City. 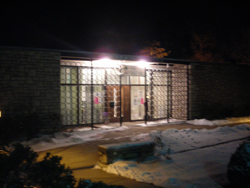 The JAS is a cultural group that meets in the Loose Park Rose Garden building throughout the year and hosts lectures and events related to learning about and understanding Japanese culture. 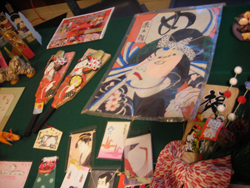 The two big events that they are involved with every year are the Greater Kansas City Japan Festival (which I’ve blogged about here) and Kurashiki Week. Kurashiki Week is a very cool thing. Kurashiki is a sister city in Japan, and every year they send a plane load of people to Kansas City to experience America. The JAS arranges this experience and does neat stuff like take them to Royals baseball games and tours of museums and whatnot, and generally facilitates their having a good time here. I’ve been a member of JAS for going on my third year now (I think), though my meeting attendance is sporadic. The meeting opened with Jim Kanki, this year’s JAS President, introducing new people. Like I said before, my attendance is spotty so while some people recognize me others don’t, and I think I’ve been introduced as “new” about three times so far! 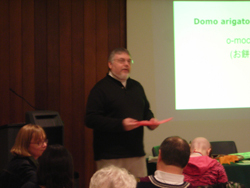 I must go to more meetings and be more social… He also introduced Warren McAllen, president of the Kansas City J.E.T. Alumni Association. The JETAA is an association of former JET program teachers, which is a group sponsored by the Japanese government to bring native English speakers to Japanese classrooms. I know a couple people involved in JET in one fashion or another. It’s something I’ve kicked around applying for myself once I graduate, but I’m afraid my tattoos would hold me back. Other business was mentioned in brief, including the fact that the JAS is sending six student ambassadors to Japan this year. Last year because of the H1N1 scare the students didn’t get to go, so they’ve been invited to participate this year, which is super cool of every authority figure and responsible adult involved. 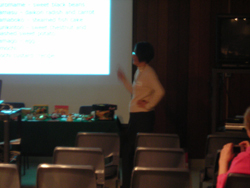 And then we got on to tonight’s presentation topic, which was Japanese New Year’s customs. 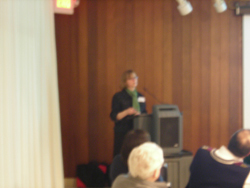 Patty Woods, the JAS 2cnd Vice President MC’d the presentation. Several people were involved in different research areas for tonight’s lecture, and I got the impression that Patty’s job was as the wrangler of all of that. She also started off with laying out the JAS program for the 2010 year, and all of it sounded pretty good. Then she laid out how the lecture was going to go, starting us off with a brief overview. I learned a new word tonight, “toshigami” which is “god of the coming year”. I guess in American terms that would be the baby with the 2010 sash on him we see around New Year’s. Japanese Shinto kami are a lot like European Asatru vaettir. It’s not a perfect analogy, but it’s easier to understand than thinking of the year as a god. Or a baby wearing a sash. I guess. Sechie (whose last name I don’t recall) did a lot of the actual presentation. She was also joined by a teen member of JAS who has family in the JAS and back in Japan. This is where the JAS shines as a learning/cultural exchange environment. It’s not just dry academic lectures, but ordinary folk taking the initiative to relate to one another on a meaningful level across culture. Since the JAS is mostly populated by families there is also a relaxed, family environment. Many of the members have known each other for a long time, which also contributes to the atmosphere of these things. At times I feel like an outsider for it, and since I’m single I tend to avoid the more social events, but I love the general meetings and the lectures. There’s always something to learn. 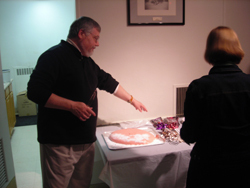 Warren gave a short presentation on mochi, was is part of Japanese New Year’s custom. The traditional way to make it is sort of a production. There’s this big rice ball in a stone bowl and two or three fellows with bloody great mallets that are taking turns continuously whacking it, while another brave fellow manipulates it in the bowl in between whacks. It’s a great way to get your hand smashed if just one person in the process isn’t paying attention, and these are not small mallets at all. Warren has a machine that makes it, and it was working during the presentation, being timed to be finished about the time the lecture was over. 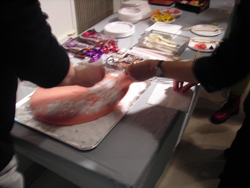 Here’s Warren helping the folk in attendance to prepare their own mochi balls. You grab a bit of it and pull, then he slices off the bit with a knife. That way you’re only touching the part you’re going to eat yourself. You make a little all and then flatten it in your palm, then the filler gets put on it and you mold the mochi around it. Being Americans we had Hershey’s Kisses chocolates instead of bean paste. This is the second time I’ve tried mochi. 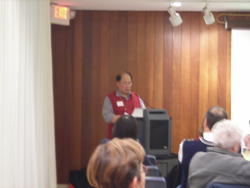 The first was when Warren brought his machine to the Japanese language contest that is held every year in Johnson County. I hate to say it, but I just flat out don’t like mochi. It’s very chewy and sticky and in the end it’s pureed rice. Even with a chocolate candy in the middle it just doesn’t have a pleasant flavor. The whole process of it is fun, though, and everyone had a good time. There wasn’t a large turn out tonight. Apparently the Japanese ice skating team was on this evening, and several of the families had opted to stay in to watch that. There was also some severe snow over in parts of the Missouri side, so you really can’t fault folk for staying in and watching the box instead. Normally there’s two to three times as many people as we had tonight, but it was good that it wasn’t so crowded I think. There was some samplings of traditional Japanese New Year’s foods to be had, and I was happy to find out the treat that I liked the most was the “custard mochi” that we had received the recipe to during Warren’s presentation. It’s the personal recipe of one of the member’s kinfolk, and I have to say I enjoyed it enough to save the instructions to have a go at it myself at some future point. 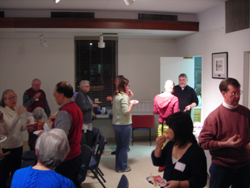 And here follow some more regrettably tiny pictures of the event. Warren with the fresh mochi batch. It’s not normally pink, but “it’s a festival” he said. 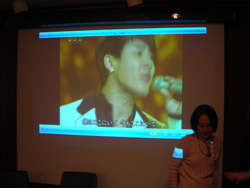 During the treat eating and socializing this video was payed from NHK, Japan’s mega-media corporation, displaying a popular New Year’s song contest. 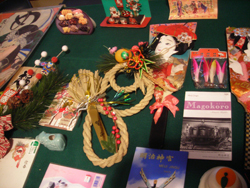 A snapshot of the table of tradition Japanese New Year’s items. And finally, another shot of the milling around and socializing.